Converging thoughts. During late 2013, I had several unrelated discussions about the possible role of genetic modifiers of SCN1A in Dravet Syndrome. To some extent, SCN1A is a paradox. One the one hand, the connection between Dravet Syndrome and SCN1A is one of the clearest connections between gene and disease that we see in genetic epilepsies. On the other hand, we see a remarkable phenotypic heterogeneity in families, and some presumably pathogenic SCN1A variants can also be identified in unaffected control individuals. This leaves us with the question whether there are genetic modifiers in Dravet Syndrome that might help provide some insight into additional mechanisms of disease. This post is a collection of 10 individual thoughts that emerged during the discussions last year. 1 – What is there to modify? When we discuss modifier genes, we implicitly assume that some parts of the phenotype are variable and possibly under genetic control. We have learned much about Dravet Syndrome in the last decade, but what would be the key phenotypic features that we would focus on when looking at modifiers? Age of onset, neurocognitive outcome, duration of the epilepsy, response to certain antiepileptic drugs? Are these factors variable enough in patients that it would allow us to assume a modifying effect of some sort? While, as clinicians, we appreciate that the Dravet phenotype can be variable, do we have a good idea about the big picture, the “Dravet phenome” in the overall population of Dravet patients? It might be worthwhile to define and explore phenotypic dimensions in patients with SCN1A-positive Dravet Syndrome that may be suitable for the search for modifier genes. To put if differently, the Dravet phenome would need to precede the Dravet genome. 2 – Is the variability genetic and “meaningfully genetic”? As a second step, we would need to acknowledge that variability in a phenotype might not necessarily be under genetic control. Given that we have a poor understanding of environmental factors that impact on neurological disease phenotypes in general, it is difficult to argue for or against the role of a genetic factor. Basically, we would only know if we look for it. The more important question would be whether genetic factors that modify phenotypic features in Dravet Syndrome would be clinically meaningful. While a common variant increasing the risk for poor neurocognitive outcome by a factor of 2 might be considered important with respect to understanding the underlying mechanisms, the clinical relevance is limited. Basically, as with many results from genome-wide association studies, the increase in risk would only be marginal and insufficient for genetic counseling. 3 – When looking, look everywhere. The era of candidate gene studies is over. Candidate gene studies are investigations that focus on a particular gene with a certain hypothesis. While this type of study is the method of choice if the mechanism is known, it is dangerous when applying this to an unknown scenario. Take ion channel genes, for example. We might assume that genetic modifiers for Dravet Syndrome may be ion channel genes. However, are we sure enough of this fact to allow for a less skeptical approach towards possible gene findings? One of the few things we have learned from association studies is the high level of skepticism that we need to keep up when performing association studies. Instead of a p = 0.05, we require a much more stringent significance cut-off, usually in the 10 e-8 zone. And when we apply these stringent thresholds, we might as well look at a large number of genes since our a priori choice of a particular gene might not necessarily be correct. 4 – Numbers matter. The search of modifier genes with small sample numbers would only make sense if we expect a black-or-white answer. With the rising number of sequenced trio exomes in patients with Dravet Syndrome, we can already tell that the answer is more complicated. There is no single additional gene that is always mutated in Dravet patients. For any other assessment of modifier genes, we need statistics. And we would need a certain number of patients, ideally in the range of 200-500 or more. 5 – Data matters. Generating genetic data is expensive and will still be expensive in the future. With more and more genetic data generated every day, exome or genome data on patients with Dravet Syndrome may be collected for future analysis. Again, don’t look at small numbers, but make sure that data is not lost for upcoming studies. It might even be worthwhile to consider a Dravet phenome/genome database that would combine phenotypic and genomic data. 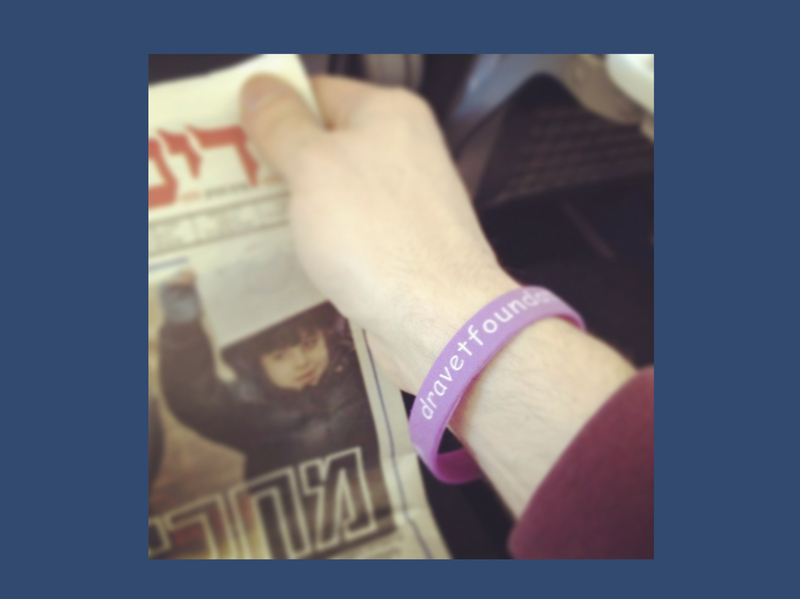 Wearing my Dravet Awareness bracelet on the flight to Tel Aviv last December. 6 – Identification of modifier genes is possible. This post should not distract from the fact that the search for modifier genes in Dravet Syndrome is worthwhile. In fact, Dravet Syndrome would be the best suited disease to start the hunt for modifier genes. Take a look at our post last year on modifier genes in Cystic Fibrosis to learn about the basic “ingredients” that such a study must have. 7 – Could GEFS+ families be the key? Some large GEFS+ families show a remarkable phenotypic heterogeneity. The same SCN1A mutation can be found in patients with Dravet Syndrome or severe epilepsies and in unaffected carriers. It is tempting to assume that we would easily identify modifying factors when all family members underwent whole-genome sequencing. Unfortunately, this is not true. Even if we generated this data in a family with 20-25 affected individuals, the possible signal would probably too weak to be detected in the flood of genomic variants. We might simply get lost. One possibility to overcome this problem is pooling of various families into a single study, but this would assume that we are looking at shared genetic risk factors. 8 – Don’t forget SCN1A. We usually claim that there is little genotype/phenotype correlation with the respect to the SCN1A gene and phenotypic features of Dravet Syndrome. But is this really true? Would we start to see patterns if we looked at larger datasets of 1000-2000 patients? This data is out there. 9 – A single exome/genome will tell you little. There are hundreds of rare variants in any exome and thousands of private variants in every genome. While it might be worthwhile to assess whether a certain pattern comes up if these variants are considered in combination, the methods behind this are tricky and not well established. As of 2014, we understand little of gene-gene interaction, and exome analysis is limited to monogenic diseases or specific candidate genes. With private, unrelated rare variants floating around in our exomes and genomes, extracting more information from a single genome might still be a major challenge in the future. 10 – Remember Karl Popper and that things cannot be proven. Karl Popper was a science philosopher pointing out that any empirical scientific hypothesis can never be proven, but only falsified. This basically means that the foundation of science is the attempt to disprove a given hypothesis (the level of surprise if falsification fails is the p-value). This approach clashes heavily with the way that academia works: we receive credit for gene identification, not falsification. Also, we would rather prove mechanisms than disprove them. While there is no short term solution to overcome the tension between the proper scientific approach and the scientific sales pitch, it is important to keep in mind that a hypothesis that cannot be disproven is not a scientific hypothesis. Accordingly, it is possibly dubious to claim that variants in ion channel genes must be genetic modifiers, but we simply haven’t found them yet. According to Popper, the journey to discover modifier genes for Dravet Syndrome will a the journey of repeated failures to disprove their existence. It won’t be the barely significant finding that we cling to, but the signal that is too stubborn to go away in repeated studies. We just have to make sure that our studies are designed in a way that allows the stubbornness to show through. This entry was posted in 2014, Bioinformatics, Epileptic encephalopathy, EuroEPINOMICS, Familial epilepsies, Opinion and tagged CACNA1A, cystic fibrosis, Dravet Syndrome, exome sequencing, falsification, GEFS+, genome-wide association study, genome-wide significance, Karl Popper, modifier genes, motivation, p-value, phenome, SCN1A, SCN1A-negative Dravet Syndrome, SCN2A, SCN9A, statistical power. Bookmark the permalink. We are working with Dravet patients. I think knowledge of clinical response/non-response to therapeutics is an important dimension to this story.